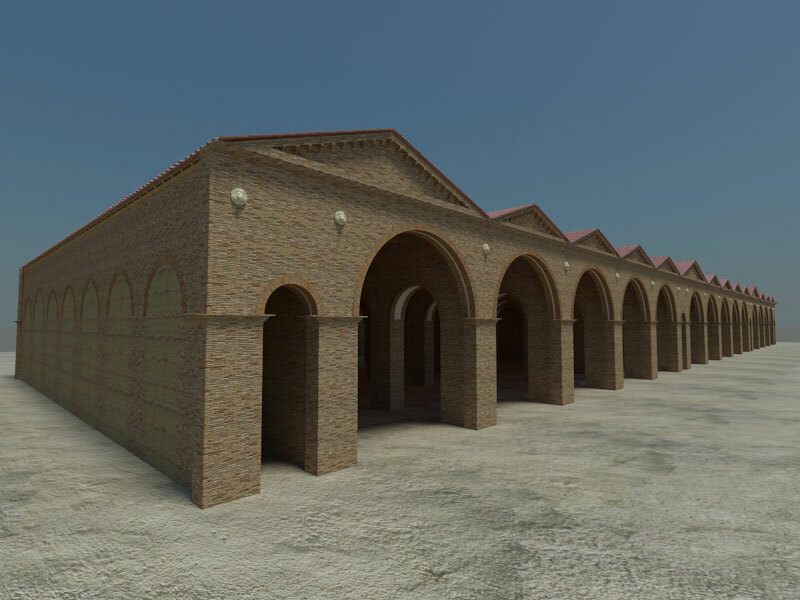 At the site of Portus we are working with a multitude of data types – including geophysical data, laser scanning, photogrammetry, as well as a body of standing and excavated architecture. 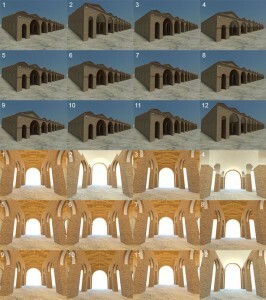 The problem of synthesising such a wide range of data, as well as dealing with the inherent fragmentary and uncertain nature of archaeological data, means that as we use 3D modelling technologies to help us interpret the original form of structures – and communicate these interpretations to the public – we must allow flexibility to explore alternatives and explore the uncertainty in our interpretative processes. Building 5 is an excellent example of these complexities- due to its enigmatic function, lack of clear architectural parallels elsewhere in the Roman world, and the huge scale of the building, which rules out a complete excavation. To explore these issues, and aid in our interpretation of the structure, a model of Building 5 was created using the grammar-based procedural modelling technology ‘CGA Shape’, part of CityEngine software package. This approach allows the creation of parametric architectural models that can be adapted through both user input and probabilistic processes, and thus can be used to generate alternative visualisations of buildings based on archaeological data. The approach has allowed us to explore uncertainty in the internal layout of the structure, configuration of the superstructure (including styles of vaulting and timber framing) and its decorative elements. Parameters of the model are expressed as probabilities to reflect interpretive uncertainty, resulting in a stochastic procedure that can be used to generate any number of unpredictable visualisations.